One of the great things about owning a pet rabbit is that you can grow a lot of their food yourself in a backyard garden. In fact, you don’t have to be a master gardener or own a huge plot of land to grow a few of your bunny’s favorites. If you’re new to the gardening world or have limited space, a great way to grow vegetables is in containers. You can build a 4×4-foot raised bed fairly economically using planks of untreated pine. You could even use scrap wood. 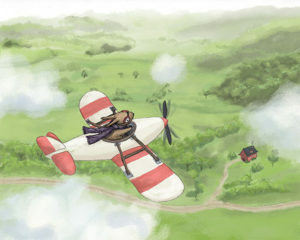 But you have to make sure that the wood you choose is free of chemicals that can leach into the soil. In addition to raised beds, you can grow a lot of plants in pots. The key to container gardening is making sure you use a good potting mix that provides essential nutrients, aeration, and moisture control. Lettuce is fairly easy to grow. You can direct seed lettuce into a raised bed, and you can grow several plants in a small space. For head lettuce like romaine, you can grow four heads per square foot. For leaf lettuce, you can grow as many as 16 per square foot. With leaf lettuce, you have the added benefit of being able to clip leaves from the outside and leaving the plant to replenish itself. 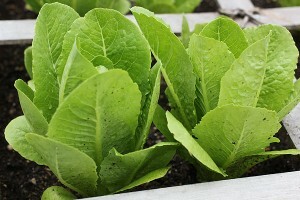 With head lettuce, once it’s grown, you chop the entire plant and reseed. Lettuce is a cooler weather crop, thriving in temperatures around 50-60°F (10-15°C). They do best planted in the spring and fall. However, you can find more heat-resistant varieties from seed banks like SeedSavers.org that you can grow all summer long. In very hot climates, you may want to place your raised bed in a shadier location or construct a shade to keep them cooler. Bok choy (aka Chinese cabbage or pak choi) germinates and grows quickly. Direct seed bok choy into a raised bed in the spring or fall as it is a cool weather crop. The soil should be loose and rich. Take care to weed your raised bed so the weeds do not take vital nutrients away from the bok choy plants. After about 45-50 days, bok choy reaches maturity. Be sure to harvest the plants before the weather gets hot because they will bolt (go to seed) quickly. Carrots can also be directly seeded into a raised bed, although it’s best to use smaller varieties for container gardening. Carrots prefer loose soil, free of rocks, to grow. Aside from thinning the plants to 16 per square foot and keeping the space weed-free, carrots are fairly easy to maintain. The Paris Market carrots seen here provide just enough of a treat for rabbits. 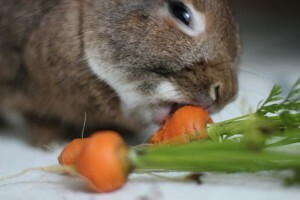 (Carrots should be given sparingly to rabbits.) They enjoy the leafy tops as well. Herbs are great for containers. You can grow an assortment of herbs like basil, oregano, mint, parsley, and cilantro that your rabbit will love. Some herbs, like mint, are best placed in pots because they are hardy and spread easily. Mint can easily take over a space if not contained. What can be easier than growing weeds? Growing dandelions is a snap. Most likely, you’ll even be able to collect the plants and seeds from your own yard (as long as your yard isn’t chemically treated.) If you’re going to plant dandelion seeds, it is best to place them in pots so they don’t spread to the rest of your garden, strangling out other plants. All you do is take a handful of seeds, spread them over the top of your soil, cover them ever so lightly with dirt, and then water. (Dandelion seeds need light to germinate.) Before you know it, you’ll have a pot of delicious greens for your rabbit to enjoy. And these hardy plants keep coming back even after you cut the leaves down. Make sure you thin the seedlings, leaving only the strongest plant in the allotted space. This allows healthy plants the room and nutrients they need to thrive. Make sure the container you use has good drainage. Soil should be moist but not muddy. 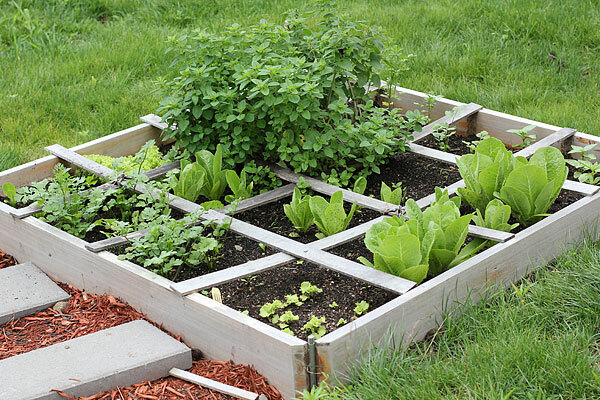 Alternating the placement of plants by square foot (so that you don’t have all the same kind of plant in one raised bed) can help prevent the occurrence of disease and pests. Plant crops successively for continual harvest.